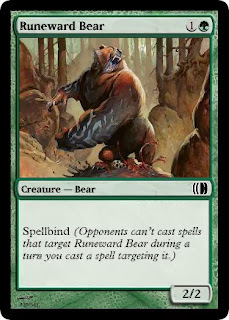 11/26/2013 - Almost two years ago, I explored spellbind and runeward, mechanics that would combat the risk of enchanting your own creatures. I recently found a better way to template the keyword. This is strictly worse hexproof, and while Development has a troubled relationship with hexproof, it's already an evergreen keyword. 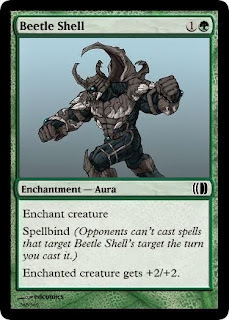 It's hard to see how a new keyword ability that's worse than an ability that goes in every set would be well-received. Strictly worse than a mechanic so broken that everyone but everyone knows its broken seems like a good place to be. More importantly, you can keep spellbind off of creatures and only put it on auras (or other spells) so that it's apples and oranges with hexproof. Hexproof is only broken if you rely on spot removal to deal with creatures. Invisible Stalker and (maybe) Sigarda are non-interactive, but in general hexproof is well-balanced and actually encourages interaction. That being said, I like the idea of putting spellbind on auras only, and I love that it also works on (some) instants and sorceries. It's basically a subset of Split Second, which is totally fine. Unfortunately it's probably too narrow and rules-y to be an evergreen keyword (not to mention that.all current evergreen keywords can apply to creatures). ~ has hexproof on your turn. @Ipaulsen I used some hyperbole, of course, but Wizards' track record with hexproof speaks for itself. I'd love to hear more about how hexproof encourages interaction. If you ask me, (1) is the *least* interactive of any of these options. And for many decks, it's the default choice. Rather than interacting in combat (2/3) or at least considering the rest of the board (4/5), you just cast a spell that more or less reads "kill this thing," and there's very little an opponent can do to stop it. Now make the opposing creature hexproof, so that (1) is off the table. You still have a bunch of ways to deal it; they're just more interactive now. That's good for the game-- *except* when the hexproof creature in question is actually non-interactive in those scenarios (e.g. unblockable, unsacrificable, or indestructible). Then, yes, profitable interaction becomes difficult or impossible. But in the typical use case of hexproof, all that happens is that *more* interaction becomes necessary. Hexproof isn't perfect, I admit. I would rather see a keyword that stopped Wrath (non-interactive) and didn't stop Prey Upon (interactive). But given the tempating constraints, I think hexproof a reasonable way to encourage players to interact through combat-- which is what creatures are for, after all. I think Invisible Stalker doesn't deserve half the ire it gets. Some blame should go to finishing the cycle of Swords of X and Y, using Mirrodin-era equipment costing. And reprinting Rancor, as a tribute to the excellent development skills of the Urza's Saga team. I mean, nobody complained about the card back when it was called Silhana Ledgewalker. 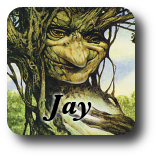 Hexproof promotes interaction by forcing you to deal with Green creatures on green terms. That seems really cool! When Hexproof reduces interaction by denying you an avenue to deal with tricky Blue creatures, that seems really... less cool. All of the above are similarly true with shroud... except that shroud doesn't let you evasive-fy your inherently non-evasive creature, thus removing the opponent's primary remaining method of interaction. Right. Shroud is even better at promoting combat interaction than hexproof, but hexproof lets you build your own monsters. Which is why I care about spellbind; it's meant to be a happy medium. As a dedicated white mage, I'd just like to mention that it's not just Doom Blade, Lightning Bolt, and O-Ring that get nerfed by hexproof. It's also such inoffensive cards as Master Decoy, Fatestitcher, Oboro Envoy, Catapult Squad, Act of Treason, and Unsummon. It's too wide for what it's trying to do. I also agree that hexproof is much, much less bad on green creatures than on blue creatures. I *did* complain about Plated Slagwurm and Troll Ascetic back in the day, but I've never once complained about shroud (mm... well, possibly about Inkwell Leviathan).